While we're not too fond of the megapixel war pushing consumer point-and-shoots to ridiculous resolutions, we certainly don't mind the recent trend of little cams getting big lenses, and Fuji could be next. Rumors and pictures of the F70 EXR have been spreading on all manners of forums and internets, promising a new half-inch, 10 megapixel sensor backing a 27 - 270mm lens, all packaged in a rather svelte looking exterior (another glimpse below). 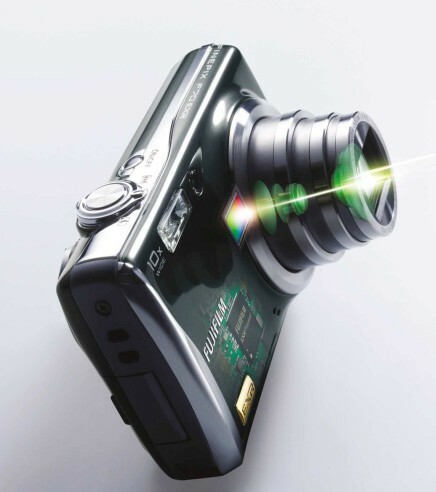 Mechanical image stabilization is said to be on offer, but rumored VGA video capture will be a disappointment if true. Also being discussed is the S200fs, a supposed follow-up to the "why won't this lens come off" not quite an SLR S100FS from last year. That's all we know about that one, and while both are said to be available in September, we'd wait for some official word from Fuji before making any pre-orders at neighborhood camera shops.